Final Round: After Nov. 30, Bini's will close. At 10:30 in the morning, El Niño is spitting cold rain outside as a couple argues over the eight-ball. "It's ahead of the line, right?" asks a man in a Harley-Davidson T-shirt, a mammoth belt buckle and a leather Confederate cap. Dale Yoshihara looks up from his steaming bowl of soup to arbitrate. "It's behind the line," he says, casually turning back to his meal. Soon, Bini's Bar & Grille will fill up with lunch-time patrons, as it has six days a week for 65 years. Lawyers will belly up to the darkly stained wood bar next to cops, painters and cowboys. "Here there is no class," says Yoshihara, who has owned Bini's since 1978. "Everyone is the same." Last Thursday 65 members of the Jackson-Taylor neighborhood met with Councilman David Pandori at the Boys and Girls Club at Third and Jackson streets to discuss the future of Bini's. The property on which Bini's has sat since 1932, along with the San Jose Farmers' Market, has been sold. The buyer of the property, the Texas-based Fairfield Development Corporation, decided not to renew Bini's lease. The developers plan to build a 232-unit housing complex with 4,000 square feet of retail space on the block bounded by Taylor, Jackson, Seventh and Eighth streets, and they've given Yoshihara until Nov. 30 to vacate the premises. "They have not asked us to be a tenant yet," he says. "They said they have no vision of a restaurant being here." Representatives of Fairfield Development in San Jose didn't return calls for this article. But from the few discussions Dale Yoshihara has had with the developers, he's not optimistic that a compromise can be reached that would keep Bini's open. He says he's asked Fairfield to extend his lease long enough to find a new space for the business. "We want to stay in the neighborhood," Yoshihara says. "Right now if we end Nov. 30, we have nowhere to go." The Bini's lunch crowd begins to trickle in at about 11:45. John Strinic takes a seat at the elbow of the bar alongside Jerry Velarocha and an old cowboy who identifies himself only as "Lionel." "You get every type of individual you can think of here," Lionel says. "You might be talking to a cop, lawyer or a bum like me." Velarocha sits on the end of the bar. When the phone rings, he answers it, "Bini's! Hey, it's for Dale," he yells across the bar. "You can enjoy a drink here without someone roughing you up," he says. "Not that I can't take care of myself. But the toughest guys are pussycats in here." Strinic, an engineer, is wearing an blue oxford shirt and a blue and red striped tie. He points to the table over which he closed an $8 million deal. "This is a historic landmark," Strinic says. "We help one another. If I need police help, an attorney or labor, it's all right here." "I'm an endangered species!" Lionel injects. He retired from ranching in the east hills four months ago. Velarocha, who wears a handlebar mustache and a red bandanna on his head, used to help Lionel brand his cattle. "You can't even get on a horse anymore," he teases. 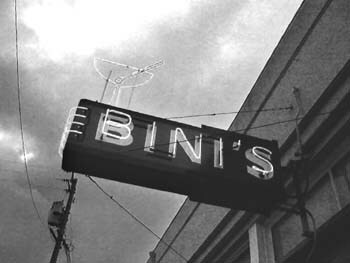 There are no Corinthian columns in Bini's, just well-worn chairs, a marlin mounted on the wall, $4.99 entrées and people from all walks of life who call the place home. When the neon sign with the martini glass goes out, a San Jose institution will go with it. Historic landmarks are judged by their wood, plaster, glass and stone. But buildings go up and come down overnight. Communities grow only in those special places that welcome people off the street and encourage them to stay awhile. Bini's has been just that: first for cannery district workers, then for the Civic Center's cops, lawyers, judges and pols. On the street, there are white cowboy hats, red bandannas and power ties. Inside Bini's, Strinic says, there are only people and San Joseans. "This place has a commitment to the success of San Jose," he says. "When it closes, where are we going to go?"